First, while everyone seems to recommend them right off the bat, I’ve never personally seen a baler with its own engine (here in the Middle West, anyway), so I have no idea whether you would even be able to find one (they do exist). 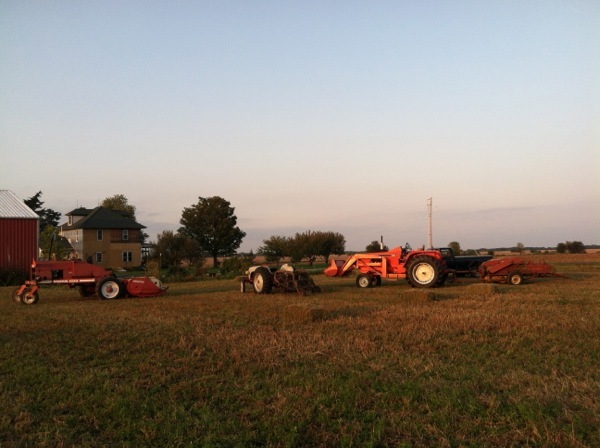 1) Rake your windrows fairly light. They can be heavier than what we were baling in the video, but if you go too heavy, you’ll quickly learn how to do the Texas Two Step with the clutch, as you have “dead PTO” and have to pop it out of gear and let the clutch back in until the baler clears its throat and you can start moving again. 2) Bale on flat, or nearly flat ground. The baler itself weighs nearly as much as the N, and with a full rack behind that, you have a recipe for “unintended acceleration” down a hill. The N was never known for its good brakes. 3) Take it easy (which pretty much sums up 1 & 2). Don’t push it, and if you feel like you’re unsafe, give it a rest and think through what you’re doing before proceeding or stopping altogether. 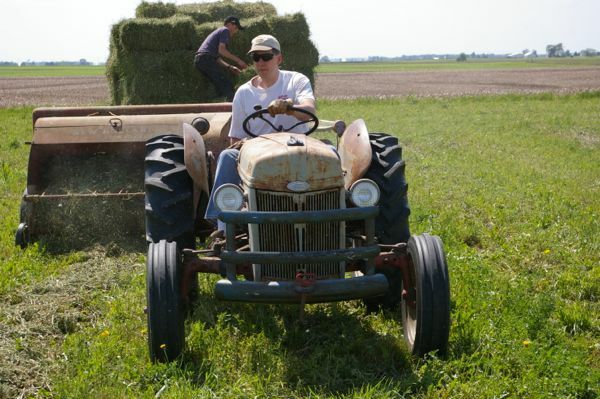 If you’ve never baled before, I’d strongly suggest finding someone to custom bale for you and let you ride along until you get a feel for what’s going on. If you have nothing, and are planning to buy everything you need, including the tractor, similar or not much more $$ than what you’d spend on a reliable 8N will buy you a later model Ford (or other color if that’s not an issue) with “live PTO,” more HP and weight… I had no hesitation running my New Holland Hayliner 68 baler with my 75HP AC 190 after I bought it for loader work. That lets me keep the rake on the N, and I now cut with a Hesston 6400. Before I got the Hesston and AC, the 8N did everything, which meant an awful lot of implement changes for each cutting.